Logicalis, Anuta Networks and Hewlett Packard Enterprise are coming together to develop a proof-of-concept (PoC) that offers a complete managed end-to-end network orchestration solution to leading telecommunications customers in Asia Pacific, enabling faster time to market for new and differentiated services. The IT department is struggling to deliver new systems and functionality at the pace that the business needs to consume them. To regain control, it will need to make an important transition and change the relationship between IT and its core platforms. It needs to look towards adopting a Service-Defined Infrastructure model that will enable the IT department to switch its focus from a physical fix to policy-driven service provisioning and decision making. The acceptance and importance of digital in society, government and business makes digital enablement the number one priority for CEOs in the next 10 years. Digital is disrupting every aspect of business - from the way businesses think about how they interact with customers and develop new products, to the way they disrupt the competition and maximise profitability. Chris Gabriel, Chief Digital Officer, Logicalis Europe, contends that the power balance, the understanding of value and the desire to innovate and disrupt, are now firmly in the minds and hands of executives, and not just the CIO, who are now able to appreciate and realise the potential of technology without being technologists themselves. Batman v Superman: Dawn of Justice, on 31 March 2016 at Golden Village VivoCity. 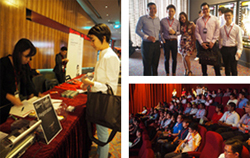 Prior to the featured film, Yeo Siang Tiong, Channel Director of Hewlett Packard Enterprise gave a welcome address while Allen Wang, Lead of Cloud and Systems of Logicalis Singapore presented on 'Managed IT as a Business' and the latest solutions update. Logicalis is pleased to announce that Mackay Memorial Hospital, one of the largest and oldest medical institutions in Taiwan, has chosen Logicalis Taiwan as the solutions integrator to upgrade its communications systems and adopt a Unified Communications (UC) solution that transforms the user experience through an intelligent and advanced patient infotainment system. Internationally renowned Spanish jewelry company Carrera y Carrera (CYC) has sought the partnership of Logicalis Hong Kong to develop the company's first branch network in Macau and the region. Welcome to the Logicalis team! Eugene will oversee the Logicalis Unified Communications (UC) solution practice for the region, providing technical and advisory expertise to drive growth in the Logicalis Unified Communications and Collaboration (UC&C) platform. He has led and managed the UC&C consultancy while he was with Logicalis from 2008-2012 and also during his tenure with BT in the subsequent years, during which he supported and advised clients such as Ingram Micro, DBS and Telekom Malaysia in the areas of UC&C strategy.